Each tablet contains: Ibandronate monosodium monohydrate: 168.750 mg. Excipients: Microcrystalline cellulose. pregelatinised starch, collodial silicon dioxide, sodium estearyl fumarate, croscamellose sodium, Opadry YS-1-7300, Opadry YS-7006, polyetthylen glycol 6000. Ibandronate inhibits osteoclast activity and reduces bone resorption and tumover. Ibandronate action on bone tissue is based on its affinity for hydroxyapatite, which is part of the bone mineral matrix. It reduces the high bone turnover rate in postmenopausal women, thus producing a gain of bone mass. Absorption: Ibandronate absorption takes place in the upper gastrointestinal tract. Cmax are obtained within a time period from 0.5-2 hrs (median: 1 hr) following an oral dose in fasted healthy postmenopausal women. Mean oral bioavailability of 2.5 mg ibandronate is approximately 0.6% compared to IV administration. Oral bioavailability is reduced by 90% when ibandronate is co-administered with a standard breakfast. However, no bioavailability reduction has been observed when ibandronate is taken at least 60 minutes before breakfast. Consequently, the intake of either food or beverage (other than plain water) reduces ibandronate bioavailability and its effect on bone mineral density. Distribution: After absorption, ibandronate is either rapidly taken up by the bone or excreted in the urine. In humans, the volume of distribution is at least 90 liters and the amount of dose removed from circulation by the bone is about 40-50%. In vitro protein biding in human serum ranges from 99.5-90.9% for ibandronate concentrations of 2-10ng/ml, and is approximately 85.7% for concentrations of 0.5-10 ng/ml. Metabolism: Ibandronate does not undergo hepatic metabolism and does not inhibit the hepatic cytochrome P450 system. Ibandronate is eliminated by renal excretion. There is no evidence that ibandronate is metabolized in humans. Elimination: The amount of ibandronate not absorbed into the bone is eliminated unchanged by the kidney (approximately 50% to 60% of the total absorbed dose). Unabsorbed fraction from the gastrointestinal tract is eliminated unchanged in the feces. Ibandronate elimination from plasma is multiphasic. Its renal clearance and distribution into bone are responsible for a rapid and early decrease of its plasma concentrations, reaching 10% of the Cmax within 8 hrs after oral administration. Then follows a slower phase during which ibandronate redistributes back into the bloodstream from the bone compartment. The apparent terminal half-life for the 150 mg oral dose ranges from 37-157 hrs in healthy postmenopausal women. Total clearance of ibandronate varies from 84 to 160 ml/min. Renal clearance accounts from 50-60% of total clearance and is related to Clcr. Pediatrics: Ibandronate pharmacokinetics has not been evaluated in patients below 18 years of age. Geriatric: No other differences than age-related changes in renal function have been observed between adult and geriatric patients. Gender: Ibandronate bioavailability and pharmacokinetics are similar in both men and women. Race: Pharmacokinetic differences among races have not been studied. Renal impairment: Renal clearance of ibandronate in patients with renal impairment is linearly related to Clcr. After the IV administration of a single 0.5 mg ibandronate dose, patients with Clcr 40-70 ml/min showed 55% higher exposure (AUC∞) than the exposure observed in subjects with Clcr >90 ml/min. Patients with Clcr <30 ml/min had more than a 2-fold increase in exposure compared to the exposure for healthy subjects. Liver impairment: No studies have been performed to assess ibandronate pharmacokinetics in patients with liver impairment because ibandronate is not metabolized in the human liver. Hypersensitivity to ibandronate or any Adromux ingredients. Hypocalcemia, Inability to remain standing or sitting upright for at least 60 minutes. Like other orally administered bisphosphonates, ibandronate may cause upper gastrointestinal disorders such as dysphagia, esophagitis, and esophageal or gastric ulcer. General: An adequate intake of calcium and vitamin D is important in all patients. Patients should receive calcium and vitamin D supplementation if the dietary supply is inadequate. No dose adjustment is required in elderly subject or for patients with liver impairment. No dose adjustment is necessary for patients with mild or moderate renal impairment. The use of ibandronate is not recommended in patients with severe renal impairment (Clcr <30 ml/min). Mineral Metabolism: Hypocalcemia and other disturbances of bone and mineral metabolism should be treated before starting ibandronate therapy. An adequate intake of calcium and vitamin D is important in all patients to prevent hypocalcemia. There have been postmarketing reports of hypocalcemia following dosing. Gastrointestinal disorders: Orally administrated bisphosphanates are associated with upper gastrointestinal disorders such as esophagitis, dysphagia, and esophageal or gastric ulcers. The patients should be instructed to comply with dosing instructions in order to minimize the risk of these effects, and to discontinue the treatment and seek medical attention if any of the following symptoms appear or worsen: esophageal irritation, pain when swallowing, retrostemal pain or heartburn. Renal impairment: Ibandronate use is not recommended in patients with severe renal impairment (Clcr <30 ml/min). Jaw Osteonecrosis: Cases of osteonecrosis, mainly of the jaw, have been reported in patients treated with bisphosphonates by IV route, especially in cancer patients undergoing dental procedures, though some have occurred in orally treated patients due to postmenopausal osteoporosis or other diagnoses. Known risk factors for osteonecrosis include a diagnosis of cancer, concomitant therapies (e.g., corticosteroids, chemotherapy, radiotherapy), and co-morbid disorders (e.g., anemia, coagulopathy, infections, pre-existing dental disease). For patients who develop osteonecrosis of the jaw during the course of the bisphophonate therapy, dental surgery may exacerbate the condition. There are no data available to suggest whether the discontinuation of the bisphosphonate treatment may reduce the risk of osteonecrosis of the jaw. The treating physician/dentist should decide on the best treatment option for each patient based on individual benefit/risk assessment. Musculoskeletal pain: Severe and occasionally incapacitating bone, joint, and/or muscle pain has been reported in patients treated with bisphosphonates approved for the prevention and treatment of osteoporosis, including ibandronate. However, reports are infrequent and, in the majority of cases, pain ceases after discontinuation of treatment. A subgroup recurred when rechallenged with the same drug or another bisphosphonate. Discontinuation of treatment should be evaluated if severe symptoms develop. Most patients were postmenopausal women. The time to onset of symptoms varied from one day to several months after starting the drug. In placebo-controlled clinical trials with ibandronate, the amount of patients with these symptoms was similar in both groups. Pediatric use: Effectiveness and safety have not been established in children. Ibandronate does not inhibit the hepatic sytochrome P450 system and does not appear to compete with transport systems involved in the renal excretion of other drugs. Antacids, calcium supplements or products containing multivalent cations (such as aluminium, magnesium, iron): They are likely to interfere with ibandronate absorption and, therefore, should be taken at least 60 minutes after ibandronate oral administration. In addition, patients should wait at least 80 minutes after ibandronate intake in order to take any other oral medication. Aspirin and other NSAIDs: these compounds may cause gastrointestinal irritation and, hence, caution should be taken in case of requiring the concomitant use of these compounds with ibandronate. Histamine H2-receptor antagonists: in pharmacokinetic interaction studies in healthy volunteers, co-administration with ranitidine produced a 20% increase in the bioavailability of oral ibandronate, which was not considered to be clinically relevant. Drug/Laboratory test interactions: Bisphosphonates are known to interfere with the use of bone-imaging agents. Pregnancy and lactation: Bisphosphonates are incorporated into the bone matrix, from where they are gradually released over periods of weeks to years. The extent of bisphosphonate incorporation into adult bone, and hence, the amount available for release back into the systemic circulation is directly related to the total dose and duration of bisphosphonate use. Although there are no data about fetal risk in humans, bisphosphonates cause fetal harm in animals, and animal data suggest that uptake of bisphosphonates into fetal bone is greater than into maternal bone. Therefore, there is a theoretical risk of fetal harm (in the skeletal and other abnormalities) if a woman becomes pregnant after completing a course of bisphosphonate therapy. The impact of variables such as time between cessation of bisphosphonate therapy to conception, the particular bisphosphonate used, and the route of administration (IV versus oral) on fetal risk has not been established. No adequate and well controlled studies have been performed in pregnant women. Ibandronate should not be used during pregnancy unless the potential benefit justifies the potential risk to the mother and fetus. Lactation: It is unknown whether ibandronate is excreted in human milk. Because many drugs are excreted in human milk, caution should be taken when ibandronate is administered to nursing women. In lactating rats, ibandronate was detected in breast milk. Ibandronate mean concentration in milk was 1.5 times higher than its concentration in plasma. Once-monthly dosing: In a two-year comparative study between ibandronate 2.5 mg daily and ibandronate 150 mg once-monthly, in postmenopausal women, safety and tolerability profiles were similar in both oral dosing groups. Patients with active or significant pre-existing gastrointestinal disease were excluded from this trial. Patients with dyspepsia or concomitant use of NSAIDs, proton pump inhibitors and histamine (H2) antagonists were included in this study. After one year, the incidence of all-cause mortality was 0.3% in both the ibandronate 2.5 mg daily group and the ibandronate 150 mg once-monthly group. The incidence of serious adverse events was 5% in the ibandronate 2.5 mg daily group and 7% in the ibandronate 150 mg once-monthly group. The percentage of patients who withdrew from treatment due to adverse events was 9% in the 2.5 mg daily group and 8% in 150 mg once-monthly group. Table: Adverse events with an incidence ≥2% in patients treated with ibandronic acid 2.5 mg daily or 150 mg once-monthly for the treatment of postmenopausal women. a Combination of abdominal pain and upper abdominal pain. b Combination of influenza-like symptoms and acute phase reaction. c Combination of rash pruritic, rash macular, rash papular, rash generalized, rash erythematous, dermatitis, dermatitis allergic, dermatitis medicamentosa, erythema and exanthema. Reports in the medical literature indicate that bisphosphonates may be associated with ocular inflammation such as iritis and scleritis. In some cases, these events did not resolve until discontinuation of the bisphosphonate therapy. Two patients treated with ibandronate 150 mg once-monthly experienced ocular inflammation, one was a case of uveitis and the other scleritis. Gastrointestinal adverse events: The incidence of adverse events in the groups treated with ibandronate 2.5 mg daily and ibandronate 150 mg once-monthly were, respectively: dyspepsia (7% vs. 6%). Diarrhea (4% vs. 5%), and abdominal pain (5% vs. 8%). Musculoskeletal adverse events: The incidence of adverse events in the groups treated with ibandronate 2.5 mg daily and ibandronate 150 mg once-monthly were respectively: back pain (4% vs. 5%), arthralgia (4% vs. 6%) and myalgia (1% vs. 2%). General adverse events and Acute Phase reactions: Symptoms consistent with acute phase reactions have been reported with the use of different bisphosphonates. Over the two years of the study, the overall incidence of acute phase reaction symptoms was 3% in the ibandronate 2.5 mg daily group and 9% in the ibandronate 150 mg monthly group. These incidence rates are based on the reporting of any of 33 acute phase reaction like symptoms within 3 days of the monthly closing and lasting 7 days or less. No patient from the ibandronate 2.5 mg daily group and 2% of the ibandronate 150 mg once-monthly group reported the occurrence of influenza-like illness episodes. One hundred and sixty (160) postmenopausal women without osteoporosis participated in a 1-year, double-blind, placebo-controlled study with the 150mg once-monthly dose of ibrandonate for the prevention of bone loss. Seventy-seven women received ibandronic acid and 83 subjects received placebo. The overall pattern of adverse events was similar to that previously observed. After approval of the formulation, some adverse reactions have been reported. Considering that these reactions are reported voluntarily by a population of uncertain size, it is not always possible to reliably estimate their frequency or establish a causal relationship to drug exposure. Post-approval reports comprise allergic reactions including anaphylaxis, angioedema, bronchospasm and rash; hypocalcemia; musculoskeletal pain that is severe or incapacitating; osteonecrosis of the jaw. The dosage indicated for the treatment and prevention of postmenopausal osteoporosis is one 150 mg tablet taken once monthly, at regular intervals, most preferably on the same date each month. To maximize absorption and clinical benefits, Adromux should be taken at least 60 minutes before the first meal or beverage (other than water) of the day, or before taking any other medication, including antacids, calcium or vitamin supplementation. To facilitate delivery to the stomach, and thus reduce the potential for esophageal irritation, the tablets should be swallowed whole with a full glass of plain water, while the patient remains standing or sitting upright. Patients should not lie down during the 60 minutes following the intake of Adromux. Plain water is the only beverage allowed to take Adromux. Mineral water may contain high concentrates of calcium and, hence, should not be used. Patients should not chew or such the tablet because it may cause oropharyngeal ulceration. 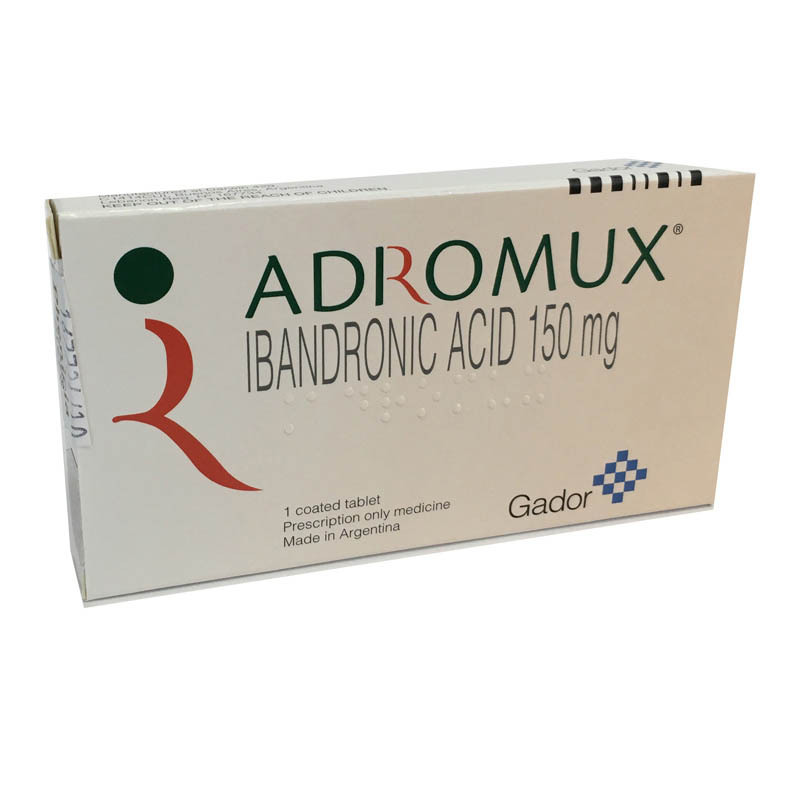 Adromux should be taken on the same date each month that is, at regular intervals of 30 days. Patients should not take 2 Adromux tablets in the same week. It may produce dyspepsia, esophagitis, gastritis, hypocalcemia, hypophosphatemia, gastroesophageal ulcer and upset stomach. There is no specific antidote for ibandronate. Treatment should be symptomatic and supportive. Milk or antacids should be given to bind ibandronate. Due to the risk of esophageal irritation, vomiting should not be induced, and the patient should remain fully upright. Dialysis would not be beneficial. Keep tablets in their original package, at room temperature (between 15 and 30°C).